We all know that words carry enormous power--the power to heal or to wound, to encourage or to dishearten, to speak truth or to deceive, to praise or to criticize. They can be the key to our success or the reason for our downfall. So, how do we harness that power? How do we learn to use our words to their greatest potential? The Power of Your Words will take you on a journey of discovery into more than just the obvious impact your words can have. Find out how to live more freely; how to connect more meaningfully; how to undo the damage of your words; and, most important, how to pause, ponder and then pray before speaking. Robert Morris wants you to know that good words last, and they carry enormous power to help, heal, encourage and move us to a greater level of living. 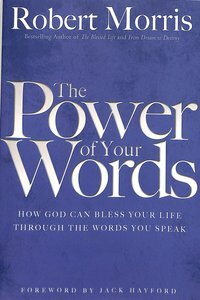 About "The Power of Your Words: How God Can Bless Your Life Through the Words You Speak"